We are a leading Manufacturer of reflective jacket, safety jacket, reflective cross belt, reflective gloves, safety helmet and polyester safety jacket from New Delhi, India. 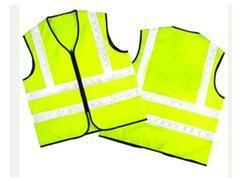 We are the prominent manufacturer, wholesaler and supplier of a wide assortment of Reflective Jackets. Our offered jackets are available in different colors, designs and sizes to fulfill the needs of our clients. For designing these jackets, we utilize superior quality rubber and cutting edge technology. We offer these jackets to our customers in different specifications and designs at market leading prices. 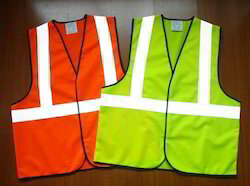 Our firm specializes in manufacturing, wholesaling and supplying a comprehensive range of Reflective Safety Jackets. The offered jackets are manufactured at our well-equipped production unit using the finest quality basic material and cutting edge technology. Our provided jackets are available in different sizes, designs and specifications in accordance with customers’ demands. Besides, clients can avail these jackets from us at industry leading prices. The polyester knitted fabric is breathable and light-weighted, which will keep you cool and comfortable at work. 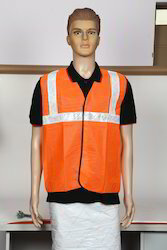 Economy class 2 safety vest with hook and loop tape will offer you compliant protection at economical price. We keep stock for regular styles, and can send out immediately. Logo imprint is available with different ways. You can also customize your own shirt by changing the color, reflective tape, fabric or adding pockets etc. 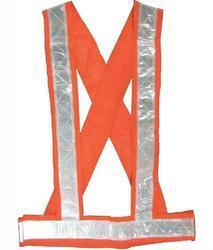 We are manufacturing, wholesaling and supplying a comprehensive range of Reflective Cross Belt. The offered cross belt is manufactured using superior quality raw material and modern techniques in sync with industry norms. Our provided cross belt is tested on different parameters so as to ensure their quality. Available in different sizes, designs and colors, this cross belt can be customized as per the demands of our clients. NB: logo and company name also printed on reflective jackets front & back at extra cost. 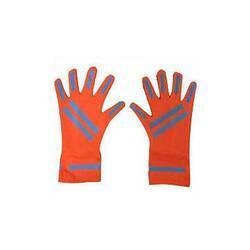 Owing to perfection and quality oriented approach, we have carved niche in the industry by offering an enormous grade array of Reflective Gloves. The offered gloves are manufactured using superior quality raw material and advanced technology in sync with adroit professionals. Furthermore, these gloves are available in different designs, sizes and specifications. To ensure its quality, these gloves are checked by our quality experts on different parameters. 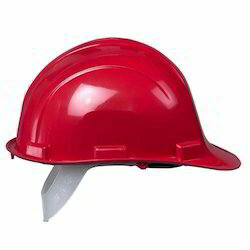 We are instrumental in offering the finest quality Safety Helmet to our prestigious clients. Used as a shield in various grinding applications, this helmet is manufactured at vendors’ end using premium quality components and advanced technology in line with industry standards. Our provided helmet is checked on different quality measures so as to ensure its quality. We offer this helmet in different designs and sizes for our customers to choose from. Our reputed entity is engaged in supplying Polyester Safety Jacket.